What has struck me most as I travel around our Rotary District 6910 visiting clubs is the unique format each club has for its meetings. I will continue to share with you a summary of what strikes me as most unique about each club along with how each club is remaining vibrant and relevant in the community it serves. 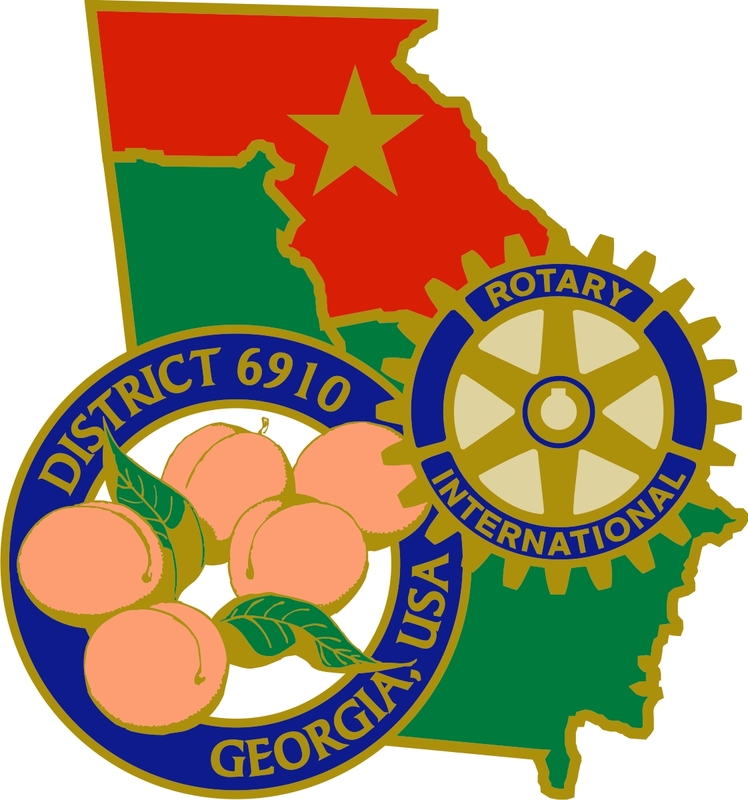 My second full week of official club visits in Rotary District 6910 took me from Gainesville to Elberton, Athens, Dawson County, and Union County, finishing up the week in Ila, Georgia with the Rotary Club of Madison County. Here are some highlights from what I learned at each of those club visits. You may get some project or fundraiser ideas for your own club. You can't miss the background music when you walk into a meeting at the Rotary Club of Gainesville. Members have an opportunity to identify who the artist is once the meeting starts. The Gainesville club had a stellar year as far as giving to The Rotary Foundation in 2015-16. Ending the year with 178 members, our largest club in Rotary District 6910 accomplished a major milestone in its history, having achieved 100% Paul Harris Fellow Club and giving of $224 per capita under immediate past president Lee Highsmith's leadership. Strong supporters of The Rotary Foundation, the club has five Major Donors of The Rotary Foundation and eight Bequest Society Members. The club's annual banquet allows for Man and Woman of the Year recognition, recognizing outstanding community leaders. An annual auction and a golf tournament are the club's major fundraisers. The 93-year-old club has been successful weaving itself into the fabric of the community, engaging youth by recognizing elementary students of the month, sponsoring a GRSP (Georgia Rotary Student Program) student, four Interact clubs and a Rotaract club and helping the disadvantaged with their wheelchair ramp projects. The club, under the leadership of President Mike Giles, aims to complete ramp #100 this year in celebration of our Rotary Foundation Centennial. 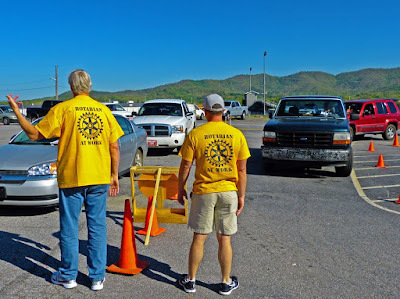 Teaching ethics to high school students, job shadowing, feeding the hungry with not only contributions but food sorting at North Georgia Food Bank are also what these Rotarians do. 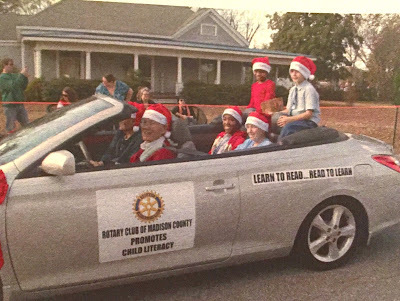 Rotary Day is celebrated with a Christmas parade each year down Gainesville's historic Green Street. The club is currently partnering with the other Hall County clubs on a public safety project honoring area public servants in Gainesville's Roosevelt Square. Also, the club has more members involved at the district level than any other club in the district. Past District Governor Bill St. Clair serves as District Foundation Chair; Hector Colon is Area XIII Assistant Governor; Carol Colon is District Conference Chair; Ann Ragle-Haynes serves as Social Media Co-Chair; David Haynes is Paul Harris Society Chair; Tommy Howard is a Service Chair and Cheryl Vandiver is District Secretary. 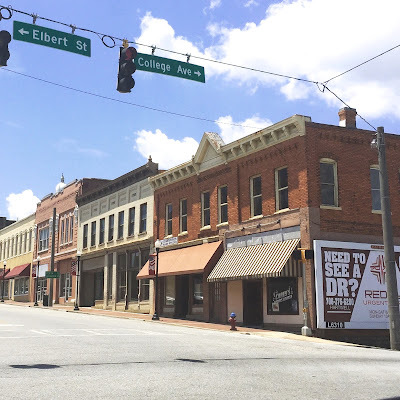 The Rotary Club of Gainesville meets on Mondays at 12:30 at the First Baptist Church on Historic Green Street. Ramp #94 was for a Gainesville resident confined to a wheelchair due to diabetes. Gainesville Rotary Club President Mike Giles is also President of The Georgia Poultry Federation. 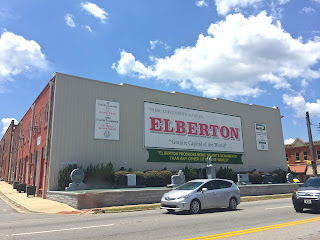 From Gainesville, the poultry capitol of the world, I went to the granite capitol of the world, Elberton. The Rotary Club of Elberton is 95 years old and ended the year 2015-16 with 41 members and a 100% Paul Harris Fellow Club. 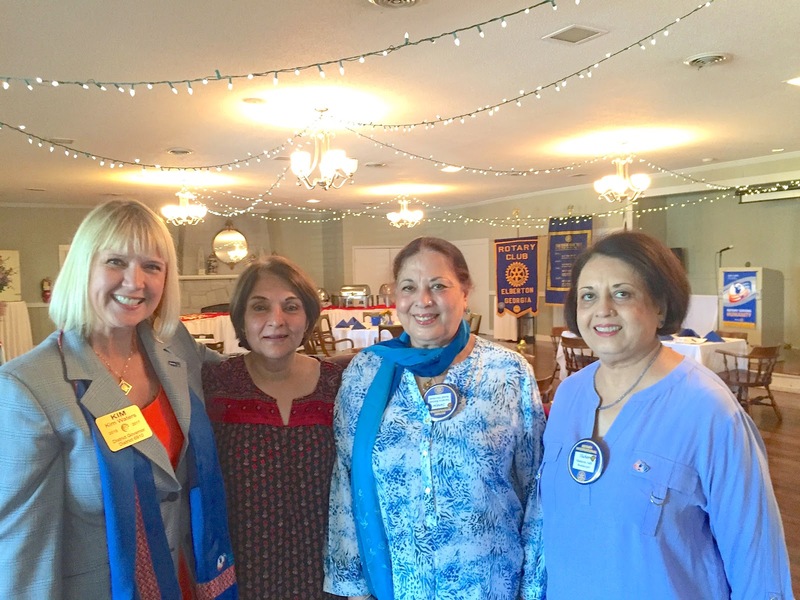 Truly an international club, the Elberton club has members who hail originally from Pakistan and Iran. The club's Foundation Centennial project is a food and necessity closet at the local high school, enabling disadvantaged students access to hygiene and food products with the club's Interact students participating in distribution. 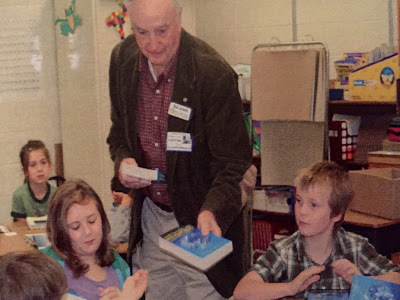 Active in the local schools, the club provides three to six scholarships annually for high school seniors with club members reading to elementary students to improve childhood literacy. Several club members expressed as to how meaningful it was last year to provide meals for nine needy families during the holiday season. Also, the club partners with local churches to provide winter coats for all ages in the community who are in need. The club's fundraisers include an annual golf tournament, a hot dog community dinner and a reverse raffle. The club also sponsors a GRSP student who attends Emmanuel College. 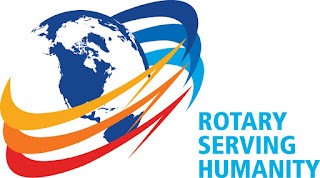 One club member is a Major Donor of The Rotary Foundation and the club boasts three Bequest Society Members. A special treat was what the club calls 'Fellowship Time.' Fellowship Time involved club member Jackson McConnell introducing his daughter Mary Margaret, who is participating in Rotary Youth Exchange and a Youth Exchange Student from Spain. They both spoke on why the program was important for them and what they anticipated to gain from it. 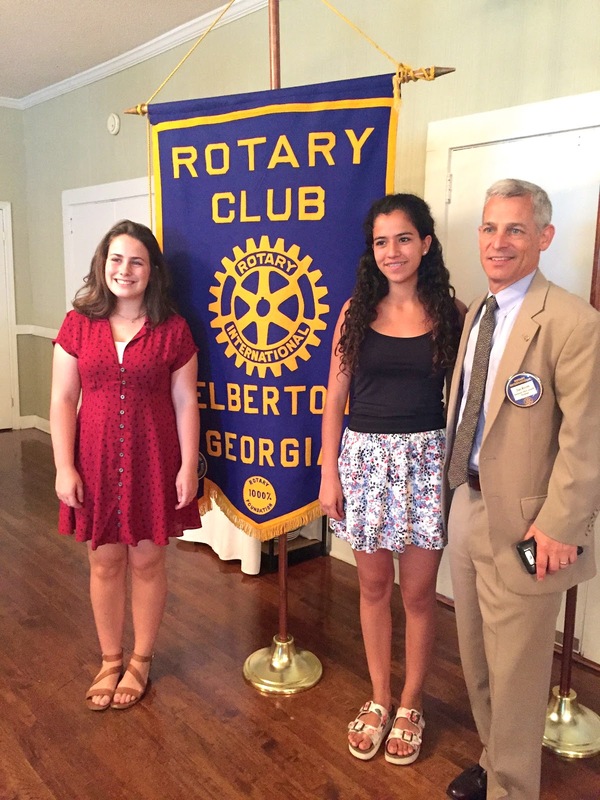 The Rotary Club of Elberton meets at the Elberton Country Club on Tuesdays at 12:10 pm. Youth Exchange Students Mary Margaret McConnell and Aina Casellas Erra of Vic, Catalonia in Spain with Mary Margaret's father, Jackson McConnell. 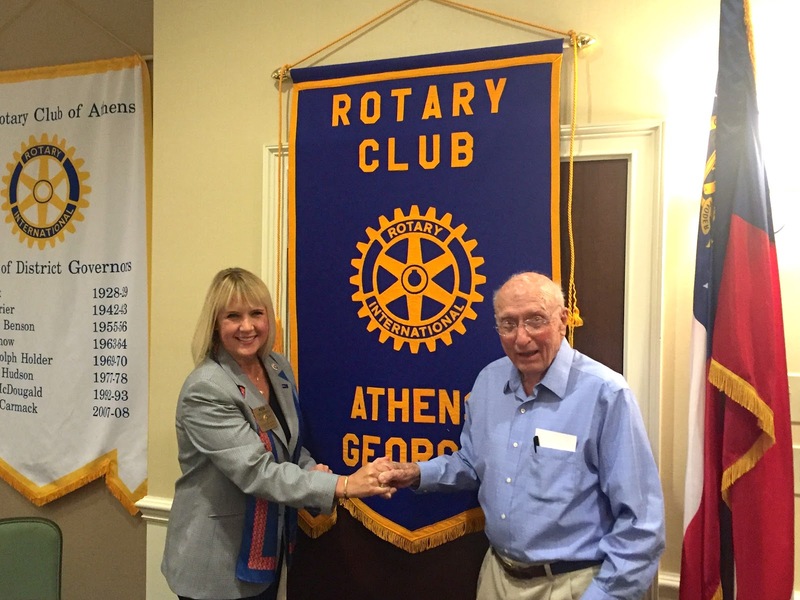 Celebrating 96 years this year, the Rotary Club of Athens ended the 2015-16 with 178 members as the 2nd largest club in the district. Known as the 'Cradle of District Governors,' the club had two past district governors in attendance during my visit, Ed Benson and Nathan Carmack. Very involved with youth, the club sponsors five Interact clubs and two Rotaract clubs (Athens Tech and University of Georgia). Also, club members are involved in reading to pre-school children, partnering with the Dolly Parton Imagination Library. The club also sponsors a dictionary project for youth and provides backpacks with school supplies for foster children. A lively annual fundraiser is the club's Plungefest held each February at Lake Chapman. The club also sponsors an annual spring barbecue. 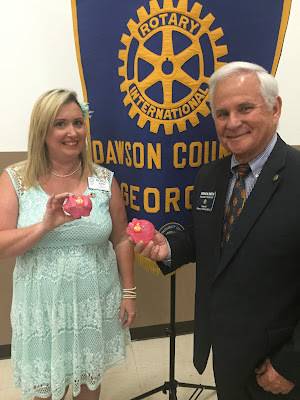 Traditions that this club carry on include the president sharing with the club historic events that took place 'on this date' and singing when club member Mike Dekle, a nationally renowned songwriter and performer, is present. 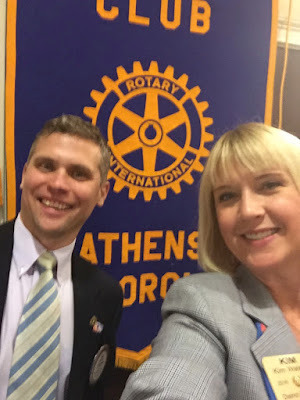 The Rotary Club of Athens meets on Wednesdays at 12:15 pm at the Holiday Inn at 197 E. Broad Street. The Rotary Club of Dawson County will celebrate 25 years in 2017. Special to me because Dawsonville is the town that raised me, having grown up there. 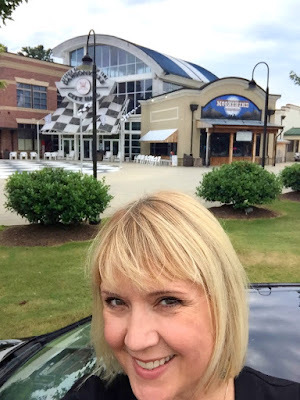 This club meets at a really fun venue, The Georgia Racing Hall of Fame on Thursday mornings at 7:30 am. 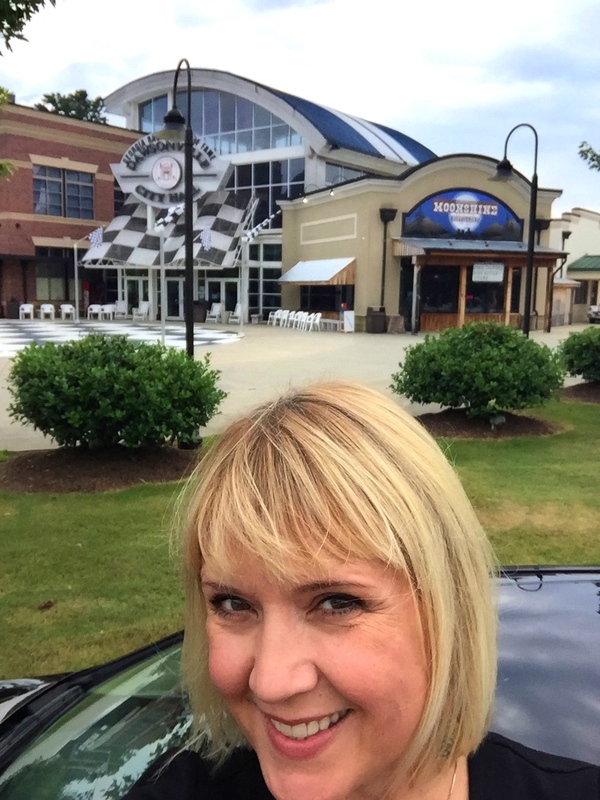 In front of The Georgia Racing Hall of Fame in Dawsonville. Celebrating the Foundation Centennial, the club has kicked off a fundraiser with a goal of raising $3000 for PolioPlus, that will become $9000 with the Gates Foundation's 2 to 1 challenge match. Wow! Also, the club recently achieved 100% Paul Harris Fellow Club. 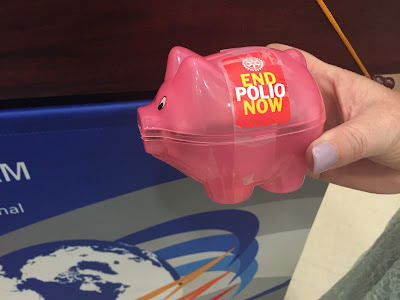 Members drop change every week in these 'piggy banks' for End Polio Now. The club ended the 2015-16 year with 73 members. District 6910 Membership Champions Pepper Pettit and Scott Yochum are membership champions within the club and constantly reaching out to the community for potential club members, not just to show up at meetings, but engage themselves within the community. 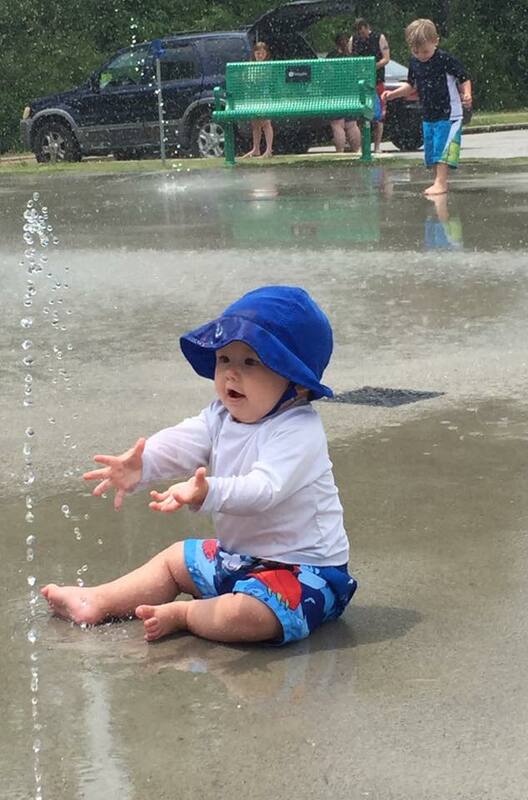 Making a tremendous impact on youth in Dawson County, the club's signature project has been Rotary Island, a splash pad at Rock Creek Park. Kids of all ages enjoy Rotary Island. These kids happen to be my great nephews, Brooks and Owen Goodwin, of Dawson County. With a focus on youth, the Dawson County Rotary Club sponsors three Interact clubs and a GRSP student. The clubs boasts 48 club projects, most helping families in need, impacting 150 families annually. The club is currently collecting backpacks and school supplies for the disadvantaged youth in the county. The Rotary Club of Union County is special to me partly because that is the club to which District Governor Gene Windham belongs. Gene was district governor the year I served as club president in 2010-11. He shared with his club that I'm the first of presidents serving that year to be a district governor. I'm sure there will be more, as his leadership inspired all of us in 2010-11. Supporting our Rotary Foundation at $174 per capita in 2015-16, the club recenlty achieved 100% Paul Harris Fellow Club. The club's project focus is area youth. Providing scholarships for high school seniors in a five county area (Towns, Union and Fannin in Georgia and Clay and Cherokee in North Carolina) and sponsoring an Interact club at Union County High School, the club's 31 members are all very much involved. President Joseph Goble says that the club is "focusing on youth today for our future tomorrow." 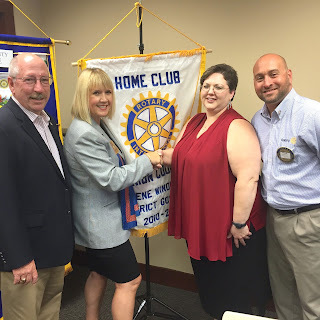 Club member Denise Windham serves as Assistant Governor for the area and has received the Service Award for a Polio-Free World for her work to end polio, having championed two area Walk-a-Thons involving youth to benefit our Polio-Plus fund. The club has sponsored a drive-through rabies vaccination clinic that serves the community's pets, and it involved the participation members and Interact students. Providing wheelchair ramps for disabled veterans is a special way club members get involved to help those who have served our country in Union County. The club is currently working on a project with youth interviewing older area residents, including those in nursing homes, writing and publishing short biographies, preserving the legacies of area mountain folk. The club's annual gala is not only a successful fundraiser, but a popular community event recognizing not only an area teacher, but public servants such as law enforcement, health care workers and other volunteers as well. The club meets on Thursdays at noon at Southern Bank and Trust's Community Room in Blairsville. 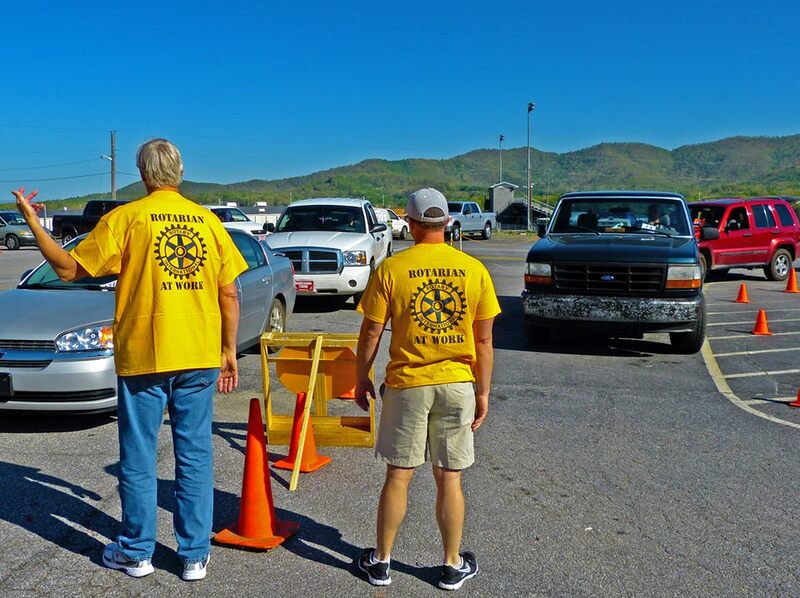 Club members direct traffic on Rabies Clinic Day that the Rotary Club of Union County sponsors. 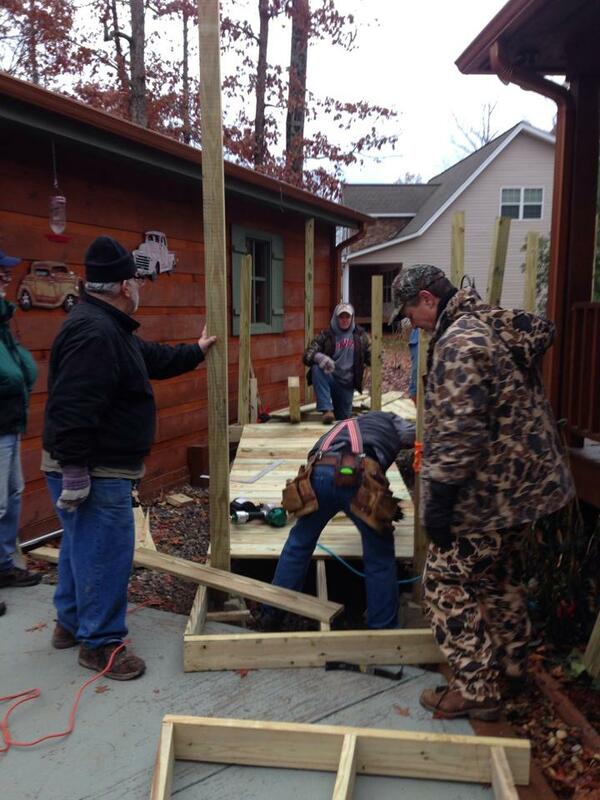 Rotary Club of Union County members build wheelchair ramps for disabled veterans. Club President Joseph Goble is leading by example in sponsoring new member Michelle Hughes. I had the honor of inducting her as a new member, and my good friend, Union County Commissioner, Lamar Paris was a special guest for my official visit. 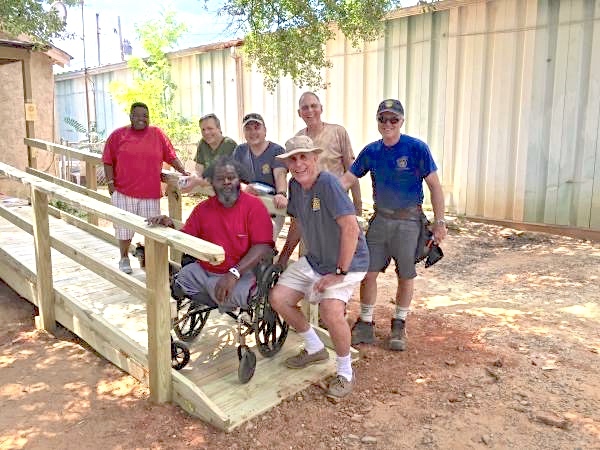 The Rotary Club of Madison County is known for building wheelchair ramps; they recently completed ramp number 634. The members build around 25 ramps annually at no charge for those in need. Madison County Rotarians stand with the recipient of ramp #634. Ending the year with 46 members, the club is a vital part of the community not only building ramps, but in areas of child literacy and food insecurity. The club partners with the Madison County Food Bank that serves approximately 2500 people annually. Active with area youth, the club sponsors an Interact club at Madison County High School. In addition to an annual golf tournament, the club's fundraisers include a reverse raffle called the 'Tax Relief Drawing' held annually and Vidalia onion sales. 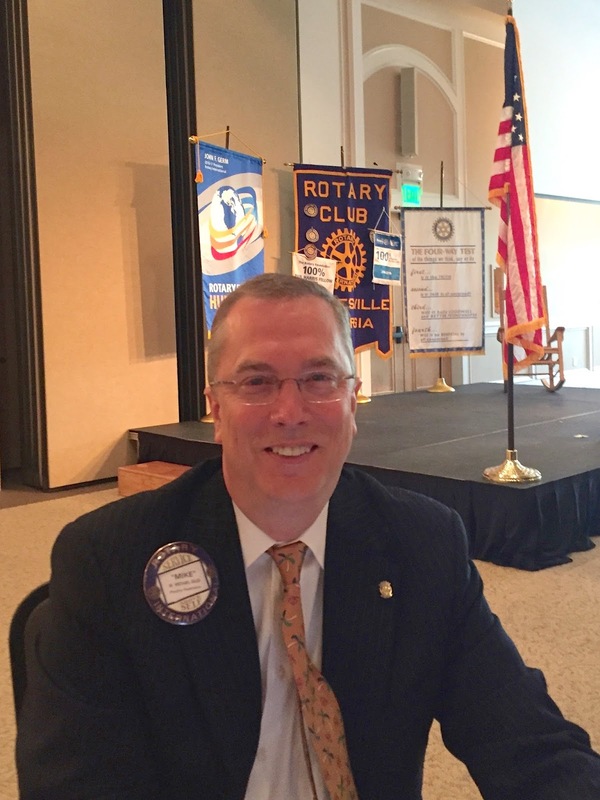 Providing leadership to the district, the club's Rotary Foundation chair, Bruce Azevedo, will serve District 6910 as Governor in 2018-19. His son, Neil Azevedo, is an active member as well. With a mission to promote child literacy, members are involved in several ways as part of the club's Child Literacy Initiative. Members read weekly to children in Head Start, area day care centers and pre-kindergarten, encouraging them to develop an interest in reading. Also, the club provides a dictionary to every 3rd grade student in Madison County. A favorite book amongst youngsters, The Polar Express, is presented to all 1st grade classes at each elementary school, the Head Start and the pre-kindergarten school. Second grade students who have made significant progress in reading are honored at the Annual Christmas Parade in Comer and the Annual 4th of July Parade in Colbert. The Rotary Club of Madison County provides a dictionary to every 3rd grader in Madison County. Outstanding 2nd graders are recognized at the annual Christmas parade in Comer. At the conclusion of my visit, the club made a significant pledge of $2000 to our District 6910 Foundation Centennial project in Haiti. Not only making a tremendous impact locally, this club is changing lives internationally as well. 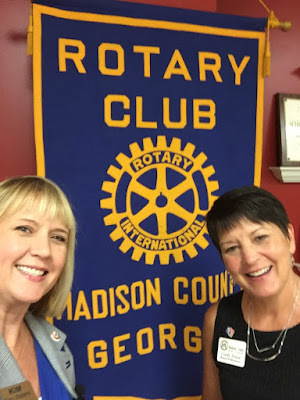 Join the Rotary Club of Madison County on Friday mornings at 7 am at the Ila Restaurant for a warm welcome and a great breakfast. 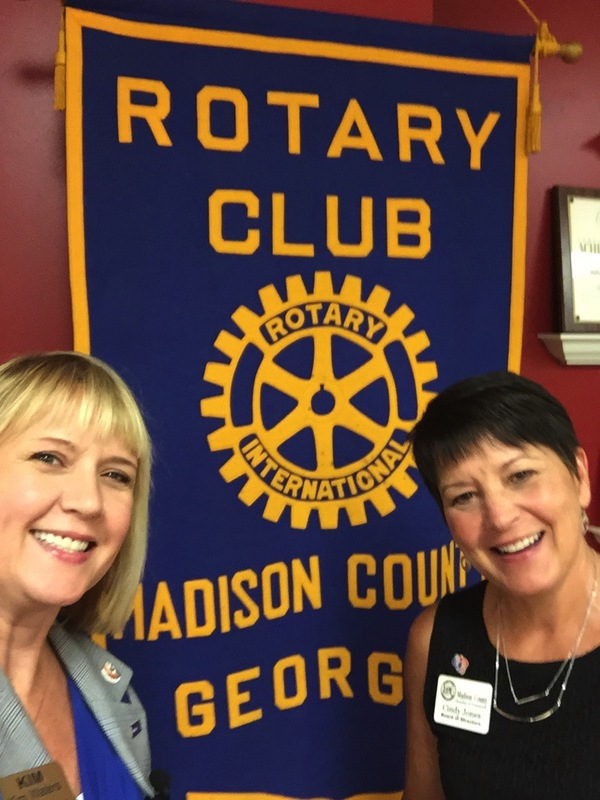 With Madison County's outstanding Rotary Club President Cindy Jones. To those I have visited already, thank you for the warm welcome and true southern hospitality. To the rest of you, I'm looking forward to seeing you a club visit soon or at District Conference in Chattanooga TN, October 7-9, 2016.